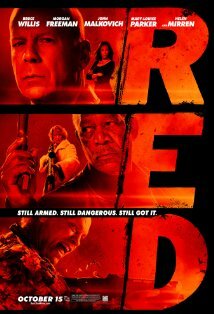 If you like Bruce Willis movies, you will like this movie. Sprinkle in the amazing Helen Mirren, Morgan Freeman and John Malkovich at his craziest and you've got a fun little movie. Is it believable...no, but than who would want a Bruce Willis movie to actually be believable. Bruce plays Frank Moses a retired black ops agent who is forced to gather his old team together when someone in the agency targets them for extermination. Also mixed in to the storyline is Frank's budding relationship with HR rep Sarah, played by the quirky Mary-Louise Parker. The bullets really fly during this movie, so sit back and just enjoy yourself. I can't wait to see this movie! It looks really interesting.